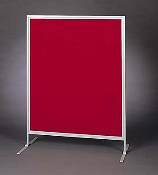 This model features attractive loop fabric mounted over tackboard, enabling you to hang your materials with push pins, Velcro-like hook tab circles or hook tape. Sturdy, tubular steel frames feature a baked enamel finish. Part #LT-440-G. Model: Light gray.